I will use components of the Venus myth to explore esoteric Venus in the chart. Venus/Aphrodite, the goddess of Desire, rose naked from the foam of the sea. Riding on a scallop shell, she stepped ashore. The Seasons clothed and adorned her. She went to three islands or ports before she found the one she liked and made her home. What are you attracted to (things, places/environments, experiences)? What is hard for you to give up? What kind of people or interaction with people do you prefer? Is there a relation between Venus in its element and what you like or prefer in your life and relationships? Venus has an elitism about certain things and a disdain for others. Her elitism can be seen in what she deems important and therefore surrounds herself with. Her disdain is to those things that are beneath her dignity. For example, she despised war, thought it messy, a bother, and totally beneath her. Venus can indicate an aversion to conflict, especially if in a water or air sign, in the 7th house, or aspect to Mars. What things do you hold in high regard, so much so that you have disdain for others? Look at the element that Venus is in, is there a correspondence? Think of the element of your Venus. Venus brings refinement to all she touches. In what way do you refine or has that element been refined as you have lived your life. and how we will achieve them. We almost lust after things that are of the Venus’ element. We have a hard time saying no to things of that element. 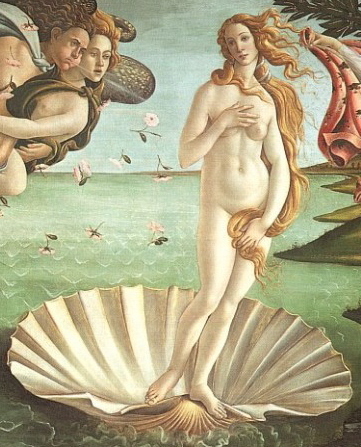 The first exploration of esoteric Venus is as Aphrodite, her Greek name and presentation. Aphrodite is a spontaneous arising from the blood and sperm of Kronos as his castrated member was tossed by Zeus into the ocean. Aphrodite, then, is a two-fold arising: she is like a wave or breaching whale or mountain-island arising from the depths of the sea, and she is the result of causes not known to her but set in motion. Esoteric Venus is the natural arising of desire and passion experienced in our mind, life, and circumstances. She represents that which can come forward for benefit or detriment. Consider each example (wave, breaching whale, or arising mountain-island) for their significance. Esoteric Venus represents the natural and obvious results of what one sets in motion. The story of Paris and Helen of Troy is an excellent example of this: representing every time one chooses to feed the desire nature. Esoteric Venus points out that there will be automatic and direct results to one’s choices. Venus, aloof in her shell, riding the waves of desire, signals detachment or lack of awareness of the law of cause-result. Being born from the ocean of completeness and harmony, esoteric Venus offers beauty, harmony, completion – as in to make whole. The house your Venus is in will be the environment and circumstances that Venus’ harmony or wholeness is trying to work its magic. Aphrodite was disrespected for her beauty. Yet, competition from other women dogged her. Esoteric Venus, representing the Soul level, offers reflection on why one compares, feels competition, and seeks to be better than others. This level of Venus also offers the release of these self-driven needs and the house provides opportunity for humility, or at lease equanimity. Venus is about relation and relatedness. In Gemini, Venus is met and meets. Venus becomes the Venusian mind, the at-one-ing factor. Esoteric Venus is a mirror to the little self, as well as the mirror of the mind. Now Venus matures into a tantric dakini or wise crone. In your chart, if Venus is in Gemini or in the 3rd house, you are being called to the Soul expression of Venus – wisdom expressed through a mature interaction with one’s desires. One must increasingly see through the false views of personal desire and entitlement to the great truth: that one’s true refinement is in service to the greater energies (ocean) of which one is a part. This is the greater twin (Gemini). To do this is to live more as the higher self and less as the desirous self. Hierarchical Venus represents the wisdom of interconnection-interdependence. In this way, Venus is Mother of Buddhas, is Isis, is the Black Madonna. Each of these iconic presentations of wisdom include the idea of that we are the gestation point and the birth point of reality. Capricorn is, archetypally, the sign of initiation. Initiation into what? Into realization. Of what? of Truth. What truth? that one’s self is the true source of one’s life and the goodness or detriment of others. The cruelty and self-serving which Capricorn is capable of is potentially eroded by the ocean of openness (emptiness) and harmony of Venus, such that highest Capricorn can demonstrate through the demonstration of highest Venus. This entry was posted in Astrology, Esoteric psychology and tagged Capricorn, esoteric astrology, Gemini, Libra, Taurus, Venus. Bookmark the permalink.